The investigation of Imran Awan and House IT staffers for Debbie Wasserman Schultz is a conservative obsession. Is There Anything to the Conservative Media Story About Debbie Wasserman Schultz’s IT Staffers? 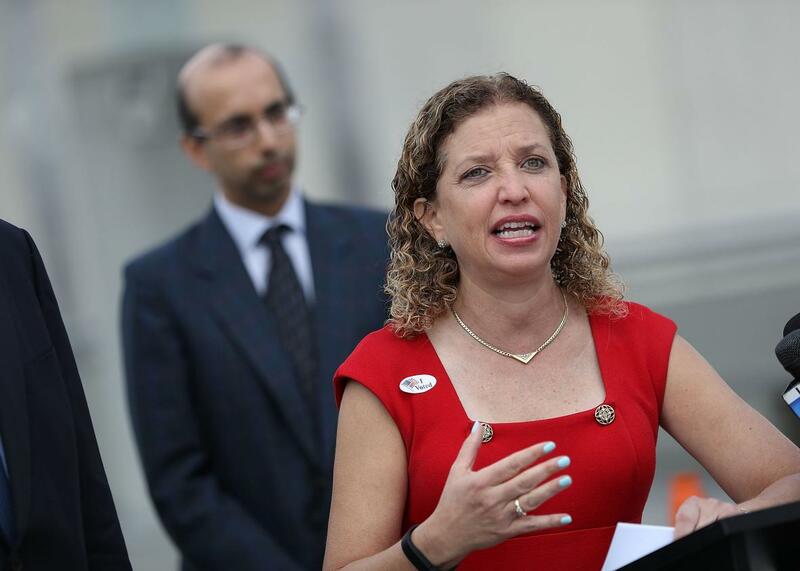 Rep. Debbie Wasserman Schultz speaks on March 14 in Fort Lauderdale, Florida. Conservative media outlets have been salivating the past several months over the twists and turns of a situation involving former Democratic National Committee Chairwoman Debbie Wasserman Schultz and her former IT employee Imran Awan, who was arrested while trying to leave the country last week. The arrest brought the case more prominently into the mainstream press—the New York Times ran an article last Friday—but without many of the sensational details that have been cooked up by conservative conspiracy-mongers since BuzzFeed broke the initial story about an investigation into congressional IT staffers in February. Here is our best effort at ferreting out which allegations in this ongoing saga are plausible, which are baseless, and what’s left to figure out. In February, BuzzFeed’s John Stanton reported that the U.S Capitol Police, at the request of members of Congress, were investigating five IT staffers working for multiple House Democrats. BuzzFeed said the staffers were being investigated for an alleged “procurement scam,” and Politico later reported their names as Awan; his wife, Hina Alvi; relatives Abid and Jamal Awan; and family friend Rao Abbas. In the same article, Politico also wrote that investigators suspected the five of accessing the House’s computer network improperly and stealing equipment from more than 20 congressional offices. According to an anonymous “former House Information Resources (HIR) technology worker with first-hand knowledge of Imran’s privileges,” Imran Awan had access to all the information on the House’s network, including emails and confidential files, and had worked to eliminate the paper trail for his information requests. Abid Awan was more than $1 million in debt owing to a failed “automotive business,” according to bankruptcy court documents and “business associates” from whom he had allegedly stolen multiple vehicles. According to anonymous tenants, the Awans had requested untraceable rent payments at their multiple Virginia rental properties. According to court documents, federal prosecutors, and former CIA case officer Philip Giraldi, the Awans owed $100,000 to an international fugitive linked to Hezbollah. According to a police report, the Awans’ stepmother had accused them of preventing her from seeing their dying father. According to an anonymous relative, the Awans had allegedly kept their stepmother in captivity and installed listening devices in her house to secure power of attorney over their dying father’s assets. According to the Awans’ stepmother, Hina Alvi had fled to Pakistan. Most of this information has yet to be corroborated by other media sources; for months, until Awan’s arrest, the Daily Caller had been the lone outlet consistently probing the Awans. But how much of the Caller’s dirt on the staffers amounts to a real scandal implicating Democratic members of Congress or Wasserman Schultz specifically? No wrongdoing involving either has been proven. Wasserman Schultz: If the equipment belongs to the member, it has been lost, they say it’s been lost and it’s been identified as that member’s, then the Capitol Police is supposed to return it. Correct? Wasserman Schultz: It’s a simple yes or no answer. If a member loses equipment, and it is found by the Capitol Police or your staff, and it is identified as that member’s equipment, and the member is not associated with any case and that is their equipment, it is supposed to be returned. Yes or no? Wasserman Schultz: I don’t understand how that’s possible. Members’ equipment is members’ equipment. It is not—under my understanding the Capitol Police is not able to confiscate members’ equipment when the member is not under investigation. It is their equipment, and it’s supposed to be returned. Verderosa: Well, I think there’s extenuating circumstances in this case, and I think that working through my counsel and the necessary personnel, if that in fact is the case, and with the permission of, through the investigation, then we’ll return the equipment. But until that’s accomplished I can’t return the equipment. Wasserman Schultz: I think you’re violating the rules when you conduct your business that way and should expect that there would be consequences. The Daily Caller alleges that Wasserman Schultz and Verderosa were actually arguing over the Capitol Police’s seizure of a laptop used by Imran Awan. When confronted about the exchange by the Daily Caller in person, Wasserman Schultz walked away, and her office declined to comment. What this all adds up to, if anything, is unclear. The right’s conspiracy theorists have taken to advancing some far-fetched scenarios, such as baselessly arguing that Awan, not Russia, may have been responsible for last year’s DNC email hack, echoing the still-kicking theories about the murder of DNC employee Seth Rich. Rod Wheeler, who is a principal promoter of the Rich story (and who is now suing Fox News for falsely quoting him about that case), has suggested that the two cases may be related. Roger Stone has claimed, without evidence, that Awan was “partying” with Seth Rich the night he was killed. The day after Awan’s arrest, pizzagate theorist Mike Cernovich posted a video purporting to explain the case and claiming that Awan may have been responsible for leaking information about a botched special operations raid in February in Yemen that resulted in the death of Navy SEAL William Owens. Rivera: Well, now you have a possible suspect. Here’s the corrupt IT guy standing at the shoulder of Debbie Wasserman Schultz, arrested at the airport trying to flee. Charged with stealing hundreds of thousands, maybe million, of dollars. What if he was the source to WikiLeaks? He has all of the passcodes, he has the passwords, he has all of the information. This is a huge story. Hannity: I think this is deeper than that. This is my theory: Maybe Debbie Wasserman Schultz didn’t want to be exposed, which is why they smashed the hard drives—remember what happened on the eve—because she knows she colluded against Bernie Sanders. She knows the primary was rigged. Stealing lawmaker's equipment, trying to flee US, wiring $ to Pakistan. Spy novel? No. It’s real life in Debbie Wasserman Shultz’s office. And on July 27, President Trump retweeted a Townhall article admonishing the mainstream press for ignoring the story. What “that” is remains extremely murky. There is no reporting connecting Awan’s arrest for bank fraud to any of the more ludicrous allegations. There are, though, some legitimate questions, namely: Did the Awans really improperly access sensitive information on the House’s network and steal that equipment? If so, why? Were their wages unusually high, and if so, why? Did Wasserman Schultz really take measures to protect Awan, and if so, why? Even if the answer to all the above is “yes,” that doesn’t necessarily implicate Wasserman Schultz or other members of Congress. It’s entirely possible, if not probable, that these staffers are simply low-level scammers who exploited a lucrative job situation and that Wasserman Schultz handled it in her usual bungled way. Imran Awan is scheduled to appear in U.S. District Court for the District of Columbia for a preliminary hearing on the bank fraud charge on Aug. 21.